American rabbi; born at Lengsfeld, near Eisenach, Saxe-Weimar, Germany, January 9, 1812; died in Chicago, Ill., January 29, 1892. 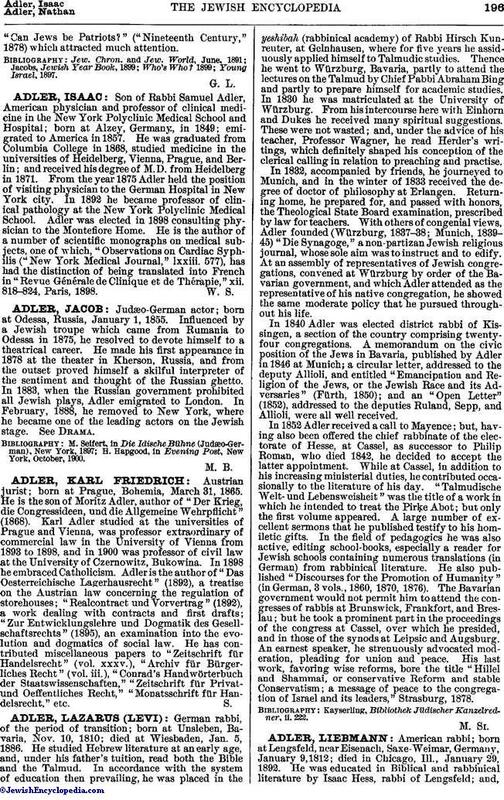 He was educated in Biblical and rabbinical literature by Isaac Hess, rabbi of Lengsfeld; and,under Rabbi Kunreuther, afterward continued his Hebrew studies in Gelnhausen, as well as at the Talmudic College in Frankfort, where, among others, Rabbi Solomon Trier and Rabbi Aaron Fuld were his teachers. On leaving the college, he pursued a course of pedagogical studies at the Teachers' Seminary at Weimar, and, after graduation there, accepted the position of teacher in his native town, Lengsfeld. 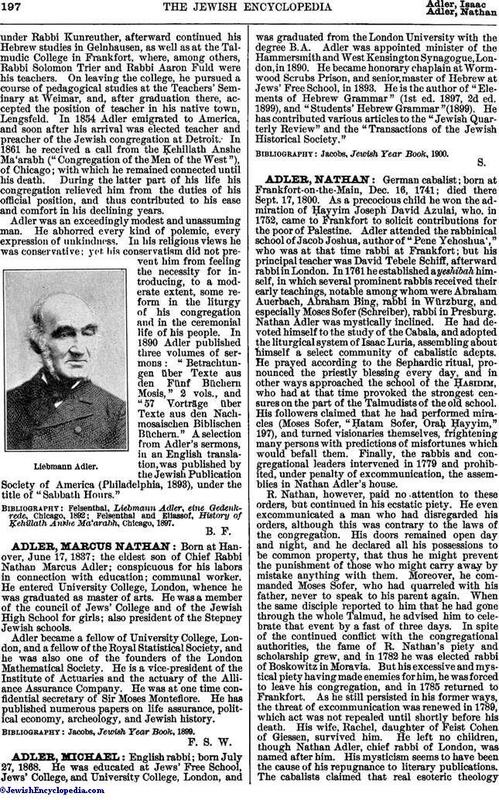 In 1854 Adler emigrated to America, and soon after his arrival was elected teacher and preacher of the Jewish congregation at Detroit. In 1861 he received a call from the Ḳehillath Anshe Ma'arabh ("Congregation of the Men of the West"), of Chicago; with which he remained connected until his death. During the latter part of his life his congregation relieved him from the duties of his official position, and thus contributed to his ease and comfort in his declining years. Adler was an exceedingly modest and unassuming man. He abhorred every kind of polemic, every expression of unkindness. In his religious views he was conservative: yet his conservatism did not prevent him from feeling the necessity for introducing, to a moderate extent, some reform in the liturgy of his congregation and in the ceremonial life of his people. In 1890 Adler published three volumes of sermons: "Betrachtungen über Texte aus den Fünf Büchern Mosis," 2 vols., and "57 Vorträge über Texte aus den Nachmosaischen Biblischen Büchern." A selection from Adler's sermons, in an English translation, was published by the Jewish Publication Society of America (Philadelphia, 1893), under the title of "Sabbath Hours." Felsenthal and Eliassof, History of Ḳehillath Anshe Ma'arabh, Chicago, 1897.